Rob Goldstone is an agent for Emin Agalarov who was married to Leyla Aliyeva -- social activist and elder daughter of the Azerbaijani President. The U.S. agreed to take $5.9 million to settle a money-laundering lawsuit tied to a $230 million Russian tax fraud, avoiding a trial that was set to begin mid May. Veselnitskaya hired Fusion to do investigative work and Fusion shared her lobbying effort in the States to get rid of the sanctions enforced on Katsyv by the Magnitsky Act of Congress. The meeting with Trump Jr. took place on June 9, 2016. Fusion GPS signed a contract with the British Orbis Business Intelligence group of Chris Steel, and Sir Andrew Wood. Orbis leadership worked as MI6 spies in the British Embassy in Moscow during the 90s. Orbis worked for Fusion from June until early November 2016. Fusion had already worked for Republican candidate Rubio who was supported by Paul Singer. There was an 'opposition' dossier on candidate Trump build up during the primaries. Fusion has financial links with Clinton supporters. Katsyv was part of the $230 million tax scam to defraud the Russian government/taxpayer. The Katsyv family's involvement in the laundering of money from Russia into Israeli banks reflects the use of weak international channels, and exposes the route of official money being sent abroad from Russia. Peter Katsyv and his son Denis Katsyv were charged in Israel in 2005 with laundering money through their Martash Investment accounts in the Israeli Hapoalim Bank. Petr Katsyv, who was the Russian Deputy Minister of Transportation, allegedly laundered, through the company and its bank accounts, 250 million Israeli shekels (about $64 million) that he skimmed off from the Russian government. Hapoalim Bank allowed for the money to be transferred, and according Sam Vaknin, there is evidence that Israel has turned a blind eye to the origin of money transferred from South Africa and Russia. Katsyv ended up settling, and Martash Investment signed an agreement with the Israeli government in order to not be indicted for money laundering. In this agreement they were ordered to pay 35 million shekels (about $8 million). The settlement reflects the overall fear from the Katsyv family of an investigation, which could have led to the source of the money. British citizen Rob Goldstone is linked to Russian Emin Agalarov and via Leyla Aliyeva to the Azerbaijani President. Rob Goldstone was used to arrange a meeting between Russian lawyer/lobbyist Natalia Veselnitskaya and the Trump campaign. Veselnitskaya did not deliver any goods about Clinton as reported so far, and from my viewpoint, the meeting does not in any way proof "collusion" between the Trump campaign and the Kremlin. Veselnitskaya is directly linked to Glenn Simpson, partner in Fusion GPS of Washington DC, an organization that worked for Republicans, Democrats and a Russian mobster [make that multiple, plural]. Fusion GPS is directly responsible and linked to British intelligence through former MI6 agents who worked in a spy nest in Moscow. I refer to their set of 16 "intelligence" documents simply as a "Dodgy Dossier" and so typically British. Orbis is facing a lawsuit for libel. From the court proceedings Chris Steele has stated that the dossier was handed by Sir Andrew Woods to Mr. Kramer, assistant to Senator John McCain. Later Orbis gave an additional December memorandum to Fusion which was handed in hard copy to McCain and a senior UK government national security official. The arranged meeting could just as well have been an entrapment by a Federal agency or IC. Trump has long been suspect of being too close to Moscow/Kremlin. Still I really have no idea what is going on! A Gordian Knot unraveling .... never believe words coming from a spook! ○ Did MI-6 - CIA Collude with Chris Steele to Entrap Trump? 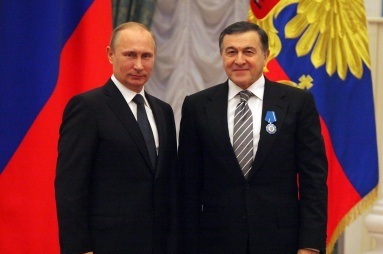 The award ceremony of Russia's outstanding citizens, including Aras Agalarov, President of Crocus Group, was held in Kremlin. The Kremlin ceremony was attended by fifty Russian citizens, who made a significant progress in various fields. "Today, we welcome prominent leaders of science, culture, art, industry, healthcare and education, diplomats and law-enforcement officers and entrepreneurs who have demonstrated high performance and social responsibility standards. I wish to thank you so much for your work and contribution to the development of this country," Vladimir Putin said. The WSJ held an interview with Peter W. Smith and published an article by Shane Harris on June 29 titled "GOP Operative Sought Clinton Emails From Hackers, Implied a Connection to Flynn". No mention Peter Smith had taken his own life 10 days after talking to journalists due to ill health and a life insurance about to expire. What role does Rupert Murdoch play who hated Trump and used Louise Mensch to 'leak' info about the British 'dodgy dossier'. Truly a final moment of fame! Was his exit choreographed? By whom? What was his true conviction in the matter? Was he really anti Russia, anti Putin? Charles C. Johnson said he also suggested that Peter Smith get in touch with Andrew Auernheimer, a hacker who goes by the alias 'Weev' and has collaborated with Johnson in the past. Auernheimer--who was released from federal prison in 2014 after having a conviction for fraud and hacking offenses vacated [on appeal - May 2014] and subsequently moved to Ukraine. This group is alt-right, anti-Putin and pro-Ukraine. RollingStone Authenticates My Analysis - Thank you!